You can’t beat the view from the back of a horse. Check out the winning stories detailing these riders’ best rides! Sponsored by Troxel! Grand prize winner Sue shares her best ride from a two-week horse riding camp at the Girl Scout National Center West, in Ten Sleep, Wyoming. Sue wins a new Troxel Venture helmet and a fleece jacket. I turned fourteen the year my dad was diagnosed with a malignant brain tumor. I had been active in Girl Scouts all my life, attending horse camp each summer as a camper first and then as a counselor when I was older. My local Girl Scout council awarded me a grant to attend a two week horse riding camp at the Girl Scout National Center West, in Ten Sleep, Wyoming, set at the base of the Grand Teton Mountains. I was assigned a cute little bay gelding named Chipper. The highlight of camp was a six day pack trip up into the mountains. We learned to pack pannier boxes and how to tie them properly onto pack horses. We rode up the steep slopes, through valleys with names like Onion Gulch, and pitched our tents in mountain meadows. We cooked over open fires, explored the opening cave of an underground river and even washed our hair in an ice cold mountain stream (with biodegradable shampoo, of course). Each night all the horses except two were let loose to roam and graze. Different teams each morning had to saddle up, go out and find the "˜bell mare'. 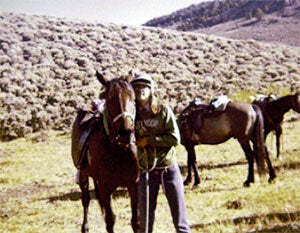 Once she was headed back to camp, all the other horses would find their way back to her and to camp. I clearly remember my turn to round up the herd. My partner and I found the bell mare pretty quickly and got her and everyone moving back to camp. Then we rode up a hill and stood on a rocky promontory overlooking the camp, with an amazing view of the valley, trees and surrounding mountain peaks. The sun was just coming up over the horizon to the east, setting the sky aflame with orange, purple, blue and gold. We just sat there on our horses, overwhelmed at the beauty of that place, and while we stood there, a great peace settled over my heart. I thought about my dad, back home, in and out of hospitals. I thought how much he would have loved being in a place like the one where I was, and that soon he was going to an even better place, with no more suffering and pain. I wept both tears of sorrow and tears of joy in that beautiful mountain retreat. One of the older girls at camp taught me to play backgammon. I had some money left over when I got home, so I bought a backgammon board. I taught my dad how to play, and we had several good games, although he often accused me of cheating! Daddy died a few months later, on December 2 of that year. Both events are forever tied together in my memory, the year I had the best horse adventure of my life, and the worst loss I could imagine. Susan’s takes us on her best ride through a hillside in Portugal! Susan wins a Troxel Sierra helmet. Everyone has a dream and mine was fulfilled when in 2007 I soloed on my first riding vacation. I signed on for a week at the Caminho dos Alentjos farm in Milfontes, Portugal. The owners were a young Dutch and English couple who not only provided a welcoming environment with outstanding horses and rides, but managed to keep the conversation going among a group of seven guests, only two of whom were native English speakers. The others were French or French Swiss. The English speakers spoke no French, the others spoke some English. Nonetheless, with Ilana and William's linguistic expertise, this international group found its base and by the end of the week we were firm friends. To us, Ilana and William had the life: beautiful farm, exquisite horses. They had come to this rural life in Portugal from a very different place, the film and travel industries in Holland. This was their dream, a dream they worked very hard to realize, and a dream on which they had chanced everything--security, finances, family. Our days were filled with long rides aboard the amazing and forgiving Lusitanos; Ilana guiding us through the eucalyptus and cork forests of southern Portugal, along village lanes and up flinty hillsides as William met us with refreshments for horses and riders at our scheduled stops. Gracious always, caring as much for their guests as much as for their horses, this pair offered us what I had always imagined a riding vacation would be. My best ride? The one where I was mounted on a kind Selle Francaise/Lusitano mare named Belle, following behind our beautiful Dutch guide and friend, in the company of like-minded people. There was a golden moment when I was flying up a hillside in what they called a petit gallop, fully confident in my mount, proud of myself for overcoming middle-aged fears, and convinced that the life that Ilana and William had was perfect. At dinner our last night at the Caminho dos Alentjos, William confessed that this would be their last group. They could no longer sustain the farm and the program. Even without a common language, we seven expressed our shock and dismay. For a full week Ilana and William had kept this news to themselves, making sure that their guests had nothing but pleasure and a carefree riding holiday; but, on this last evening in Portugal, they let their disappointment and grief show. It seems as though, sometimes, what seems perfect simply costs too much. Soon after, the horses were dispersed across Europe and the farm was sold. Our hosts picked up their lives in Holland again, their dream, like Isak Dinesen's Out of Africa, now just a memory. Once they had a farm. Joy share hers story of a close call she experienced at her ranch Marshall Canyon Equestrian Center. Joy wins a Sierra helmet. Hi, my name is Joy I am 23 years old and I am about to turn 24 in a couple of months and my mares name is Athena. My favorite ride of all times happened not too long ago in fact right in the beginning of summer with a group of my fellow boarders from our ranch Marshall Canyon Equestrian Center. We did this ride later in the day when it was finally cooling down from our dry California heat. That day we took the golf course trail, which meant that most of the trail was primarily shaded and level, not to many hills to go up and down. I was leader and I had told everyone come and follow the "Joy Ride" everyone laughed. 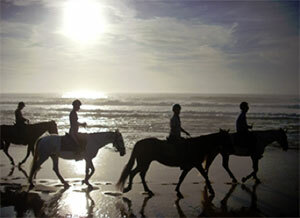 It was beautiful, absolute perfect ride and all the horses were so well behaved on that particular day, it was amazing. Towards the end of the ride there was one final hill and I decided to lope up it, I remember everyone saying are you sure Joy, we don't have too? And I said yeah, come on. Well I never made it to the top of that hill, because I didn't check my cinch and my saddle slipped to the side of Athena's body and I fell straight on my back, hitting my head on the hard ground and, watching from ground level thundering hooves pass me by. I was lucky for one I wasn't wearing a helmet and two I didn't break anything. I was grateful because I got up and I wasn't seriously injured. The only thing that was truly hurting inside me was my ego. I told myself it's time for a helmet next time you won't be as lucky and Joy if you're going to canter up a hill check your cinch first to make sure its tight and not loose. As I got up and brushed all the dirt off my body, put my saddle back on Athena made a point to check the cinch not once but twice before I got back on, I felt like an idiot I had been riding 15 + years I knew better. 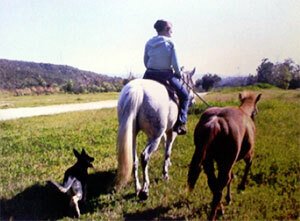 Once we started getting closer to the ranch I had realized what a fantastic ride that truly was. I had a smile on my face and I was shocked how much I really did enjoy my "Joy Ride" and so did everyone else who had tagged along. "Thanks for the great ride Joy, hope your okay!" Yeah I was very sore and my pride had been shaken up but I was extremely happy! After I was undone tacking my mare, I told myself that was a perfect ride but it's time to invest in a helmet.